I want this century to be full of people who write poems, not full of poets who conduct projects and do nothing more. There is plenty to disagree with in Dorothea Lasky’s pocketable manifesto from UDP. And that is its virtue. This is a canny invitation to talk about intention, process, and quality in poetry. 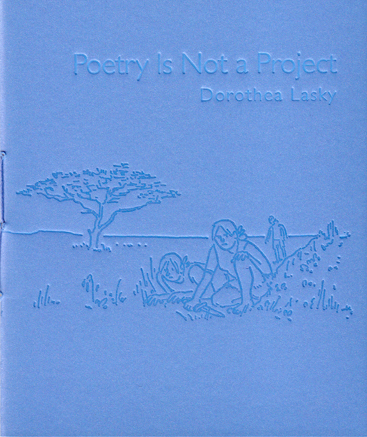 An invitation through Lasky’s direct, open language and the brevity of the pamphlet itself (14 quarter pages). Lasky isn’t riveting together the panels of an iron clad case or qualifying her points into nothing through academic speak. And for these reasons this should be required reading (in the imaginary classrooms that float in the interstitial tissue of the poetic collective consciousnesses or something like that) for anyone trying to sort out what they’re doing through poems. Anyway, what do I think of what Lasky says? The easy misreading is that she is attacking “conceptual poetry,” yet she praises flarf and uses as her example a serial ekphrastic project, which is the go to for more traditional poets when they want to write beyond the lyric narrative or birds or whatev. So clearly she is defining “project” in a rather expansive sense. If a project does not get to a real poem, then it is not that important to your work because it generates nothing. The problem I am pointing out in this pamphlet is that just because you have constructed a project does not mean you have written a poem. You can plan a party, but you have to make the people show up for it to really be a party. Any other way, all you have created is just a decorated empty room. Is this to say, the writing process dictated by the concept must leave room for the poet to exercise their powers of intuition and the outcomes of this intuitive act must be successful (successful? significant? )–that it is vital for us as readers to pay close attention, above all, to these intuitive leaps, to have a stake in them–to be thrilled or disappointed by their outcomes? Is this the difference between pleasurable engagement and pleasing contemplation? Either way, it is right and good to affirm one’s own prerogative to hate and love what is going on in a poem. I love these four ridiculously classic lines from H.D. It is good and right to hate Hoagland’s poem (above). And the one that frowns in the direction of hip-hop. (No big risks there). And isn’t hate or intense dislike a sort of compliment in and of itself? Either way, what is ultimately provocative is the call for a return to engagement with a how a poet puts a singular poem together as opposed to critical discourse’s obsession over the principles which inform how certain groups make poems. It is also a call to party, hard. I can get on board with that even as I finish up with my buddy Chad something that can only be described as a “project” about The Container Store. In particular, I’d like to think that the damning “and do nothing more” of the first quote extends to both the interior of the poem and the exterior reaches of the poets life. What they do in the world beyond conducting projects. I’d like to think the moments of intuition in a poem are only made possible via an intuitive/intentional engagement with the exterior world–one’s social praxis. (So hey, what does DL mean by ‘Habitus’? I’m not clear on this). So perhaps there are “projecty” types of procedures such as C.A. Conrads somatic experiments that dispose one toward attending to the interiors of one’s work? Wait, have I gotten to the end of a blog post again without really saying anything? Dammit. I’ll never be a good blogger because I have no real opinions. Read Poetry Is Not A Project, ok?